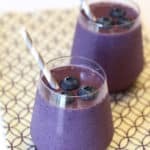 Smoothie make a quick and easy breakfast (or pick-me-up snack), and this blueberry and oat-packed recipe tastes just like the classic pastry. Try this blueberry muffin smoothie recipe and you'll be hooked. I really could drink a smoothie everyday for breakfast. Some days it’s the only thing that sounds good. I’m never super hungry in the morning, so I don’t crave a big meal. Smoothies are quick, easy and great for those days when I don’t have much time to get me and the kids out the door. It’s a good thing my whole family loves smoothies too! I love, love, love adding gluten free rolled oats to my smoothies. Helps to thicken it up and also a simple way to add that extra fiber, which is always a good thing. I made these blueberry smoothies for me and my little man. After the first sip, I thought to myself, “these taste like a blueberry muffin!” The bright blueberries, oats, vanilla almond milk and a little extra vanilla. 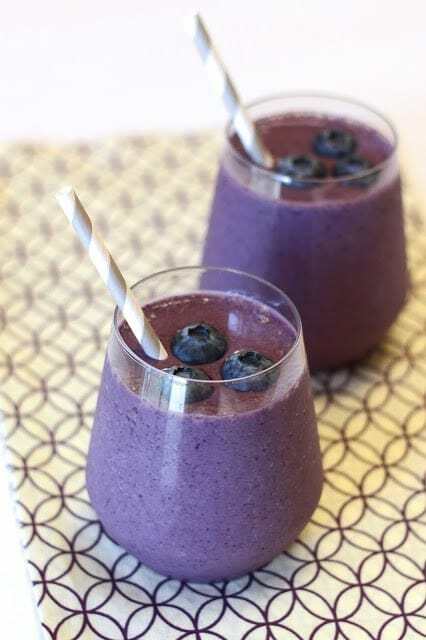 A blueberry muffin smoothie is a lovely combination to start your day or a sweet pick-me-up in the afternoon! Add all ingredients to high-powered blender. Blend on high until smooth and oats are finely ground, 1-2 minutes. Pour smoothie into glasses and serve. This entry was posted in Beverages, Dairy Free, Recipes, Recipes & Techniques by Cooks We Love and tagged food allergies, g-free, G-Free Foodie, gluten allergy, gluten free, gluten free mommy. Bookmark the permalink.